This is a simple drop stitch pattern that has minimal finishing and would be suitable in any fun, furry and nubby yarn. Lion Brand's Fancy Fur would be a good example, since the yarn that I originally made this in, Yarn Bee Playful, was discontinued. Sirdar Valentino might also be an interesting yarn to try. 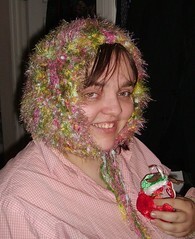 Find the Festive Winter Bonnet in my Ravelry Store or here.